My friend Linda over at Litebeing has a challenge… Litebeing’s Magnificent Challenge that I would like this post to be a part of. It is my contribution to help others understand the why’s and how’s of Being our Magnificent Self. Now is a great opportunity for each of us to own our own Magnificent and All Powerful Self and ensure we rise above the limitation, struggle and lack of the Human game. How many times a day do you catch yourself mumbling… ‘how bad I’m feeling’, ‘life is just not on my side’, ‘there seems to be no hope’, ‘all around me is turmoil, how can I live in this’ ‘I hate my job/relationship but it’s my security’… etc etc… AND you find yourself repeating this pattern day after day, oh… you might have an odd good day and are thankful, after all you’re getting older and this is how life works, isn’t it? This is indeed how we’ve been led to believe life works. A world of limitation, struggle and lack as we believe we are victims of life, but how far from the truth this is. Ask yourself who gains from you playing the role of victim. The answer is all people in power, as they feed off the surplus energy and power others don’t claim for themselves. It’s all a game, A Human game of duality, for everyone to experience success and failure, to realise what the game is all about… that life can never be won or lost by anyone and choose to own their Magnificent and All Powerful self and rise above it. Don’t worry, this game will continue even without you… but your strength to remain Magnificent and All Powerful will be tested. As we continue to see the conflict and lack of compromise within our political and religious groups around the world and even within our relationships at home and work… we can feel the emptiness… struggle… and see much disease. Everyone searches for answers outside of themselves but it leads them nowhere and all we hear are the repeated questions… How can I be happy… feel safe, loved, healthy and wealthy…. How can I sleep well… heal my pain and feel joy?… and we continue to be distracted with the chaotic mind, addictive pleasures and complex practices and tools to become better and wiser… even spiritual ones. This ongoing search keeps most of us away from the most powerful tool that is right under our own nose. Its been a long Human experience, we have struggled, suffered and lived the best we can, but we have also learned to love and be compassionate with the ones near us and come together in communities. If we have been curious and open, we have learned through the insights of ascended masters, angels and our loved ones of there being life after this life and if we have followed our inner guidence we have learned not to rely on others; unless we want to conform to their ideas, ways and give them our power. Each one of us has to make a conscious choice to live a joyous and loving life and make time for ourself… to relax in our own presence… sitting or lying in quiet contemplation, walking in nature or absorbed in some creative enjoyment. When we are joyful our mind becomes quiet and merges into a timeless space… beyond our physical reality and we experience a sense of peace, harmony and overwhelming passion. It is in this timeless space… an energy of pure love… that we can re-discover the presence of our Magnificent and All Powerful Divine self… A Divine presence that waits patiently for the busy Human to take their relationship onto a new level and journey as One Body Consciousness into the unknown. Imagine a role of wrapping paper as a metaphor for going Beyond. The inner grey tube, represents your Human life… your society, mass consciousness, karma and ancestors. It is dull, limited and uninspiring. Your physical reality is full of predictions, prophecies, traditions, beliefs systems, patterns and routines that ensures you continue to swing from the extremes of success and failure. You have adapted to living with limited thoughts, limited imagination and limited ideas. Your life and physical reality has become your comfort zone, with all its limited probabilities and possibilities, keeping you in the illusion that ‘this is it!’ You don’t consider that there might be a beautiful world, a beautiful gift outside of your perception, your dual reality and everything you know. You remain fixated in your physical reality because of your collective linear time and space, which up until now has allowed you to experience your 3D consciousness, duality and belief systems. However everything is changing and with the help of extreme light frequencies that are bombarding Earth and Humankind now, disturbing your magnetics and naturally awakening your consciousness… you are realising there is something more. If you relax and focus on yourself, you can resonate with something within that encourages you to go beyond, to release all your comforts in the physical reality. To release the tight grip it has on your life and allow your self to go out and explore what is beyond everything you could ever imagine… the magic of the unimaginable unknown. It has been a tough challenge for us all living in the physical reality that has been very dense. We have all been tightly woven into a fearful, limited and controlled society. We even FEAR the unknown… having been told its EVIL. The incoming light frequencies are naturally clearing the density on Earth and within YOU and ME and giving us all an opportunity to journey beyond what we know. It’s not about remaining inside or outside our physical reality indefinitely… it’s about allowing our self to be free to choose in each moment where we want to be, what we want to do and how we want to live our life. Afterall we are Multi dimensional beings of love and light who can have fun exploring everything. It’s about allowing our physical reality, to dissolve for a while so that we can have an extraordinary experience. I’d like to guide you on an expanded journey, for you to experience going beyond… beyond the mind, beyond physical reality and all that is known. Allow yourself to listen to my words, listen to the music, listen to the silence and explore the depths of All of yourself. Remember there is no method, no way to experience it, there is only the way you experience everything. Many thanks to Adamus from the Crimson Circle that first used a role of wrapping paper as a tool about expanding beyond that I remember well… I hope it helps you too. As you may have realised IAM very passionate about sharing the news of The Magnificent Consciousness we are all part of and how Humankind now has the opportunity to take the next quantum leap into the unknown.. rising above the fear and lack of our physical reality and creating ourself and our life anew in freedom and with abundance. I bring this to our young children in the form of my ‘Creative Art Project’ where I encourage them to paint a group painting of their bright and colourful world and their own magnificent and powerful part in it. To raise funds for this project I ask for small donations for my books and classes… for my non-profit Spanish ‘Asociacion Conciencia Magnificia’. I published my book Your Magnificent Self… A Journey to Freedom to share my journey awakening and integrating All of myself and be able to create a life of celebration as my Magnificent Self. Inspiring others to resonate with their own magnificence and remember their own natural state of being. Every END is an opportunity for a NEW beginning. 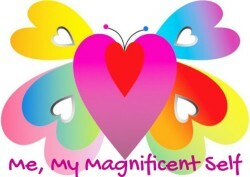 Thank you Barbara for taking the time to create this lovely offering for Litebeing’s Magnificent Challenge. I feel the passion you embody on this topic and it has made an impact on my worldview. It is important to keep on repeating the message so that more hearts awaken. Thank you for sharing, Barbara!